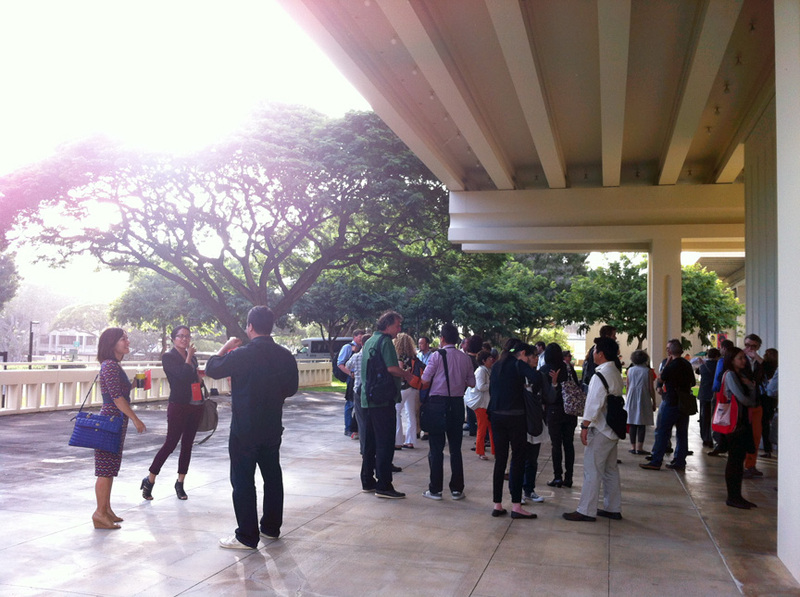 The East-West Center is set within the campus of the University of Hawaii at Manoa; a prime conference location to discuss transnational influences in design education, writes Katherine Gillieson. Luckily for its attendees, the conference, organised by United States design organisation AIGA, did not pale in contrast to the stunning setting. Straddling the line between conference genres, last month’s event combined practice, academic research and teaching in graphic design as well as related disciplines. 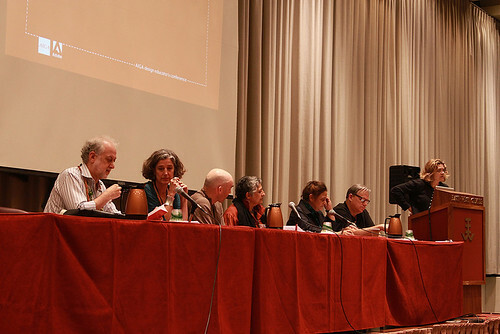 ‘Geographics: design, education and the transnational terrain’ showcased a series of notable figures in evening keynotes as well as three days of parallel sessions. Individual projects were presented in small sessions, followed by discussion in an intensely social and interactive structure that promoted debate around the themes of design education, ideas, practices and institutions in a transnational context. Michael Sorkin (left) and Matthews. Top: the lanai (patio) of the East West centre. The first keynote was delivered by theorist Ella Shohat and touched on postcolonial and transnational issues from a cultural theory perspective. Shohat reminded us of the importance of ‘in-between’ identities and of the dialogical flow of ideas between colonisers and communities that might be seen as the ‘recipients’ of new culture. Professor Michael Sorkin spoke in a lively second keynote on green architecture, calling on us to consider the social circumstances surrounding environmental issues. He presented city-level conceptual projects aiming to counter issues of population pressure on food sources and energy. The impressive multinational range of presenters included groups of speakers representing design schools (the Virginia Commonwealth University in Qatar and the Hochschule für angewandte Wissenschaft und Kunst, Germany, amongst others). Some notable talks included the dazzling Sheila Levrant de Bretteville (See Reputations, Eye 8), who spoke about her experiences working on different design projects in Hong Kong. Levrant de Bretteville’s comments during the post-session panel discussion were very wise, touching on the way her design work might have an impact on others, and on design ownership. 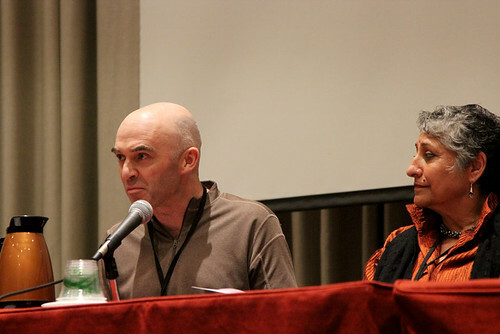 Other speakers discussed collaborative or transnational design projects, or work with foreign student groups. Sharon Poggenpohl spoke about her experience at Hong Kong Polytechnic University, and the challenge of overcoming the presumptions of the habitus (French theorist Pierre Bourdieu’s term summarising the assumptions and expectations of everyday life). Anne Giangiulio presented a compelling view of the effects of drug violence on her experience with groups of American and Mexican students at the University of Texas at el Paso, which forms a metropolitan area with the Mexican city of Juárez. Design projects involving multi-national dimensions were also presented, such as Steven McCarthy’s self-directed book works and Nancy Skolos and Bethany Johns’ presentation on the work of international RISD students inspired by archival objects. 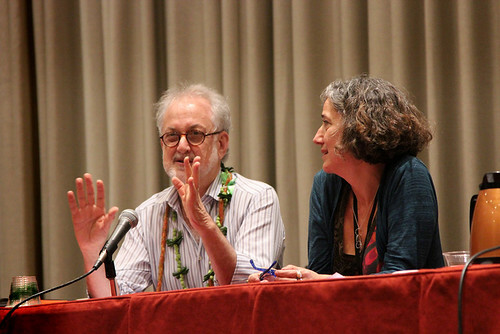 Peter Hall and Muneera Umedaly Spence. Contributions from the audience included a comment about the potential of corporatisation of this kind of collaborative work, and proposed that some presenters may have taken a slightly condescending view of their student’s culture when abroad, recalling the concept of ‘the gentle savage’. Despite the wide range of themes, ‘Geographics’ was a well tailored event, during which attendees had plenty of time to exchange ideas on the lanai (patio) of the East West centre, in a convivial environment. Examining our interactions with ‘others’, whoever these might be, is a good way for design educators to remain vigilant and question our own presumptions, in teaching as well as practice. 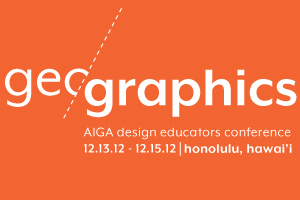 Geographics conference artwork, which uses an alternative spelling of Hawaii.